Jack Butala: Welcome to our show today. In this episode, Jill and I talk about information and inspiration. If you’re a regular listener, you’ve heard us say this maybe a million times. Jill DeWit: … who’s who. Jack Butala: Before we get into it, let’s take a question posted by one of our members on the LandInvestors.com online community. It’s free. Jill DeWit: Okay. Brian shares or asks, this is a question regarding a seller financing deal. Okay. I sell a property to a buyer and we do seller financing. He doesn’t get the deed until the balance is paid in full. Can the buyer begin building on the property or move a trailer on the property without holding title? Jack Butala: I hope so. Jack Butala: Now, this is a personal decision you have to make, but I think the more the people use it and enjoy it, the better. Jack Butala: Plus, they’re improving your property. Jill DeWit: Mm-hmm (affirmative). I’d tell them, too, say they’re thinking about it. They’re like, “Hey, can we go camp there for the weekend and see if we like it?” Heck, yeah, you know, or even when we agree on the deal and they are just so excited they want to, like you said, they want to start using it right away. I tell them, “Sure, even though the transaction is happening on Tuesday, if you want to go out there and pull weeds, go for it,” but you know what I mean. Jack Butala: I like to say this, you know, all the evil stuff you’ve ever said about lenders or even thought about, you have to take it back because now you’re a lender. Jack Butala: You’re actually a lender, Brian. Jack Butala: You call the shots. Jack Butala: You’re the bank. Jack Butala: Do you want to be an evil bank, or a good bank? Jack Butala: I say, be a good bank and set them free. Jack Butala: Let them enjoy it. Jill DeWit: You want them to start improving it and making your property nice and all that good stuff. Jack Butala: Do you have a question or you want to be on the show? Reach out to either one of us on LandInvestors.com. Today’s topic, Information and Inspiration Defined. Jill and I came up with this a lot of years ago. I’m the information and she’s the inspiration and it occurred to me recently that we talk a lot about information. Jill DeWit: We talk a lot. Jill DeWit: I thought it was going to stop there. Jack Butala: You know what’s nice about this show is we talk a lot and no one talks back. Jack Butala: Everybody’s shaking their head and they’re throwing up a little bit in their mouth. Jill DeWit: … Captain Obvious moment. Jill DeWit: Yes, it’s actually [crosstalk 00:02:27]. Jack Butala: … we just get to talk. That’s a one [crosstalk 00:02:29] direction. Jill DeWit: Those of you rolling your eyes right now, you know who you are. Jack Butala: Oh, my God. They’re talking again. Jill DeWit: Here we go. I’m actually listening to this voluntarily, sweetheart. What am I doing? Jack Butala: It just keeps playing. Jill DeWit: And, it won’t stop. Jack Butala: It keeps playing over and over. Jill DeWit: I know. I keep trying to make it stop, but the next show just loads. Dammit, get this off my phone. Sorry. Jack Butala: Why do they make it free? Jill DeWit: Too easy, make it stop. Jack Butala: If they would only just charge us for this, then I wouldn’t buy it. Jill DeWit: [crosstalk 00:03:00]. Oh, that’s good. Jack Butala: We all know what information is, right? We all know that’s my thing. Jill DeWit: Do we? Do we? Jack Butala: Jill, what’s inspiration and why is it so important? Jill DeWit: Inspiration is what keeps you going when you’re overloaded with information. That’s my new definition. Jill DeWit: I just gave up on that. Jack Butala: … number 510. Jack Butala: What’s that show about? It’s about land. How can you have 500 shows about land? Jill DeWit: That, too. What the heck do you guys have to talk about every single day? Like, this here right now. Jack Butala: No, it’s not about land. 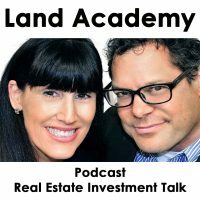 It’s really about information and inspiration about real estate investing. Well, how can [inaudible 00:03:55] up to 500 shows about that? Jill DeWit: Right? [crosstalk 00:03:57]. Jack Butala: Maybe they’re right. Jill DeWit: They might be right. I think we ran dry a year ago, but, you know I’m just kidding. Jill DeWit: Awe, I didn’t get that email. Jack Butala: I know. They sent it directly to me. Jack Butala: What do you think about that, Jill? I think there’s an inspirational situation there. Jack Butala: What would you say? I mean, you’re a lifelong salesperson and I mean, a good … You want to help. Jill DeWit: Yeah, you know what? Jack Butala: What do you say to that person? Jill DeWit: Thank you for giving it a go and realizing you’re not cut out for it and admitting it. Jack Butala: Wow, really? I didn’t think you were going to say that. Jack Butala: I thought you were going to say something inspirational. Jack Butala: Are you saying Babe to me or the person who wrote …? Jill DeWit: Yeah, yeah, you. Not to … No, not to this gentleman. No, but it’s like there’s people that maybe love the ballet, but we all look at them and know that no matter how much you love the ballet and watch ballet, there’s no way you’re going to be a ballet dancer. You need to admit that and move on. Jack Butala: It’s Eddie Van Halen’s guitar. Jill DeWit: Yeah. Yeah, my thing I came up with on that, just because you spend an hour with Eddie Van Halen and he teaches you exactly how he does it, doesn’t mean you’re going to be Eddie Van Halen. Jack Butala: Then, you’re not, you don’t know how to play the guitar after an hour. Jill DeWit: You could even spend a year and you still may not be Eddie Van Halen. Jill DeWit: You can spend five years and do the 10,000 hours. You know what? You still might not be Eddie Van Halen. You just have to accept who you are. Jack Butala: So, how do you know? Do you know right up front what you’re good at and what you’re not good at? Jack Butala: Ending a sentence with a preposition. Jill DeWit: Like, AKA grammar? No, you know what? Sometimes you don’t know. I think usually you don’t know, but you have an idea what you’re interested in and you go ahead, all in, and then something in there, well, you’ll find it. Usually, whatever it is, it will find you. You know? Jill DeWit: Exactly. I take it they’re never going to have their own business because …? Jill DeWit: There’s going to be customers who are not happy no matter what. Jack Butala: If you’re going to talk to people on any given day, you’re going to be disappointed. That’s what I say. Jack Butala: Use the word abuse. Jill DeWit: Yeah, she really would get abuse. Jill DeWit: You know, unhappy customers over ice cream. Like, they thought the vanilla was too vanilla. I’m not kidding, and they’re mad at her about it. I’m like, you’re what. They’re buying ice cream. Jill DeWit: No matter what, you’re going to have unhappy people. Jack Butala: … because this is a radio show, but my middle finger’s up. Jack Butala: It’s for all the angry customers on the planet. Jill DeWit: Right, get over it. Jack Butala: Get over it, exactly. Jill DeWit: I mean, yeah. The vanilla is too vanilla? You’re kidding me, right? I mean, they would really be unhappy about the stupidest things and they would come back at us for their money back after they ate the whole thing. It was really, I mean, you’ve got to be kidding me. Jack Butala: Do you know this ice cream is making me fat? Jack Butala: Do you know this? Jill DeWit: That’s it. I’m going to sue Haagen Dazs now because I gained 20 pounds, so you’re going to have that. Jack Butala: I’m fat because of you. Jill DeWit: I know. All right. Yeah, but no. Like I said, inspiration is what gets you up in the morning. You need to have some inspiration and you and I’ve talked about that a lot recently. Jack Butala: What inspires you? Jack Butala: It’s money for me. Jill DeWit: See, and that’s okay. For some people, it is. Some people it’s living where they want to live. Some people it’s seeing their family happy, their spouses, their children thriving. Maybe it’s solving a … Maybe it’s a cure, a medical cure. There’s all kinds of things that inspire people. Jack Butala: I’ve been asking my friends this recently. What’s it all about? Right? Jack Butala: One of my friends said, it’s about passing on the tribal knowledge. Jack Butala: It’s not about money, it’s not about retirement, it’s not about love, it’s about passing on the tribal knowledge. Jill DeWit: It’s not about that car. [inaudible 00:09:13]. Jack Butala: That’s amazing to me. Jack Butala: That inspires me, too. Jack Butala: I think it’s a version of helping people. Jill DeWit: For me, it’s like, I get off on parental pride and it doesn’t have to be my kids it can be anybody else’s kids or just anybody that I’m able to help. When I hear someone say, here’s an example. I worked with this girl years ago and she was in her early 20s. We only worked together for a brief time. You know who I’m talking about, [Mikhail 00:09:41]. Years later, she said, “You know what? I learned so much sitting next to you in that office that changed the way I do everything now, like, in business,” and the way she treats customers and little things like, I mean, the way I would talk to people, interact with my co-workers and our customers. One of my little things was candy on my desk and it would make people want to come and say hi and talk to me and enjoy my candy. Little things like that, but it was very sweet that she told me years later. She goes, “I really learned a lot from you.” I’m like, “Really?” I love that. That’s inspiring to me. Jack Butala: Nothing like that happened to me in accounting at all. Jill DeWit: What did they tell you? Jack Butala: Oh, no one knew. No, I sat at a desk. Nobody. There’s, basically, not a lot of talking in general. It’s a bunch of guys in suits going the numbers don’t … It doesn’t jive. Jill DeWit: Oh, got it. Jack Butala: Do it [again 00:10:40]. Run it again. Run it again, Steve. Jack Butala: That’s when I was Steve. Jill DeWit: What do you think this show’s about, Jack? What’s this topic mean to you? 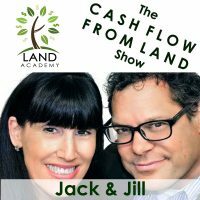 Jack Butala: This cashflow from land show? Jill DeWit: No, information and inspiration. What does this mean to you? Jack Butala: Here’s the deal. We don’t talk about inspiration enough. We talk about information and I think that, you know, all the information on the planet, if you’re not inspired to execute and stick with it, if it doesn’t make sense to you and it’s not presented in a format that makes sense and that you can digest and utilize, it’s not going to matter. Jack Butala: That’s why you’re here. Jill DeWit: … people. If you really, really, really want to do something and it doesn’t come naturally to you, can you overcome that? Heck, yeah. If you have the right inspiration and motivation, you’ll figure it out. Maybe somebody else got it out of a book and it took you 16 hours on YouTube to watch it and see it and understand it and do it, but you got there. You can do that. You can overcome stuff. Jack Butala: Somebody asked me recently. You were there. What is it with you guys? Why are you so good at this? A lot of people can’t do this. Jill DeWit: Oh, it’s true. Jack Butala: I said, it’s because there’s two of us. Everybody else that does this, it’s just a guy talking in a microphone or whatever. Jack Butala: Some guy trying to make sense. Trying to pass on tribal knowledge and because there’s two of us, I think people can relate to us better. Jack Butala: Can’t say no. Jill DeWit: Yeah. No, I know. It’s just I don’t understand the word no. Jack Butala: Jill’s Indian name is Can’t Say No. Jill DeWit: Say No. Yeah. That, too. That’s why I’m a little ragged today, thank you very much. Jack Butala: Did you have a rough night last night? Jill DeWit: Last night, oh gosh, this is like most nights. Oh, come on. One more. Let’s go one more place. Jill DeWit: Okay. I can’t. I really, I was actually kicking myself this morning. It’s funny that you brought that up because this morning I was thinking, “Oh, dammit, I should have told him at the time, like I swear he keeps trying.” I keep thinking I should say, “No, we should go home,” and no, can’t do it because it’s just fun, silly. Jack Butala: We live in paradise so that’s part of the problem. Jack Butala: I’ve seen that [crosstalk 00:13:19], too. Jack Butala: I don’t do well with that either, Jill. Jack Butala: People tell me no, it’s like, no, you know what? I think I’m going to do it now anyway. Jill DeWit: Well, it’s like business stuff. I mean, seriously. No, the way you want you to operate your business, this doesn’t comply with our something. Maybe it’s really has to do with properties or subdividing or putting in a road or something you have to do. They’re telling me no. Mm-mm(negative). Not going to happen. Oh, watch me. Jack Butala: Yeah, I agree. [crosstalk 00:13:49]. Jill DeWit: I will find the right people. I won’t be mean about it, but I’m going to have to go above your head and I’m going to make this happen. Jack Butala: Above your head. Jill DeWit: I will do that. Jack Butala: I’ll go above your head. Jill DeWit: You know what? I have no fear, too. I mean, when it comes to that kind of stuff, oh, I don’t care, I’ll call them. Watch me. Well, only the President can make that decision. Well, all right. Great. Well, then, and what’s his name and number? Jack Butala: … because I’m the same way. Jill DeWit: All right. Only the owner can do that. Jack Butala: That’s what I’m saying, so they’ll be [inaudible 00:14:26]. Jack Butala: Then, you put both of us together and we’ll double team the whole thing. Jill DeWit: Where can I find him? Anyway, sorry, but you know what? I look at that, I’m so inspired and I’m so motivated that I really want to get it done and I want to make it happen, so I’ll do whatever it takes to get there. Jack Butala: Here’s the take away of this episode. Inspiration is just as important or maybe more important than information. So, find out what inspires you. Jack Butala: Living by the ocean inspires me. Jill DeWit: Yes. Me too. Jack Butala: I mean it. Every day. I know it does for me. You’ve always said that. Jill DeWit: Every day I wake up with a smile. I’m like, I can hear the water, it’s just awesome. Jack Butala: That was a total stream of consciousness malarkey show we just had. Jill DeWit: I know. Did it show? Jack Butala: I mean, we lost at least half of our listeners. Jill DeWit: I tried to stay on topic, but it was such a broad topic. Jack Butala: I was trying to make you laugh and it didn’t really work. Jill DeWit: I hope it worked. We laughed.